It’s a chromosomal abnormality passed on by my father (Chinese by way of Malaysia); every week or so I find myself subject to an overwhelming craving for oriental food. One kitchen cupboard is kept full of Chinese, Malaysian, Thai, Indonesian and Japanese condiments, including seven kinds of soy sauce, numerous sticky brown things in jars, hermetically sealed packets of blachan (the stinkiest thing in the house, but completely necessary in a lot of Malaysian and Thai dishes), dried fungus, four different kinds of dried noodle, four kinds of rice (not including the two risotto rices in the other cupboard), lye water, pork floss, fish floss, rice wines, black and red vinegars and some mysterious tins which have lost their labels. This is all in order that this craving can be assuaged any time it hits, as long as I’m in the house. The craving thumped me between the eyes this time when we were expecting some friends. Weeping Tiger, a Thai beef dish, would hit the spot, with some Chinese noodles for some stodge. I took a good-sized piece of sirloin steak per person, and rubbed each well with kejap manis, an Indonesian sweet soy sauce. 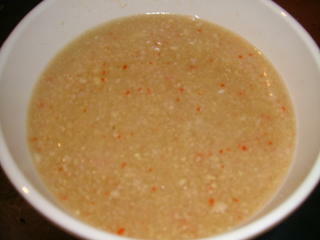 I made some Nuoc Mam Gung – a sweet, salty, strong sauce made from raw ingredients. I put a peeled piece of ginger the length of my forefinger, two peeled limes, four cloves of garlic, half a stalk of peeled lemongrass, two birds eye chilis, four tablespoons of Nam Pla (Thai fermented fish sauce – I use Squid Brand, a Thai premium brand, because it has a fabulous label) and four tablespoons of caster sugar into the Magimix, and whizzed the lot until I had a sauce. If you follow this recipe, you may prefer to use less chili; taste the sauce when it’s out of the blender and see whether you think it needs more lime juice or fish sauce. You may want to add a little water if you find it too strong. After the sirloins had marinated for half an hour, I grilled them in a very hot, stovetop grill-pan, keeping the middles pink (about two minutes per side). 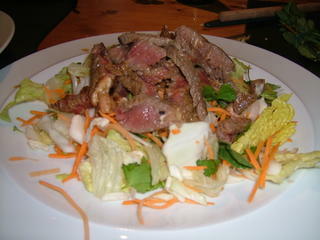 The steaks were then sliced very thin and placed, still warm, on top of a crisp salad with grated carrot, Chinese leaves, cabbage, shallot, mint leaves and coriander leaves. The nuoc mam gung I’d made earlier was drizzled on top – delicious. This dish is notably lacking in carbohydrate. To remedy this, I made a very simple garlic cauliflower noodle stir fry which my Dad used to make regularly when my brother and I were little; real childhood comfort food. 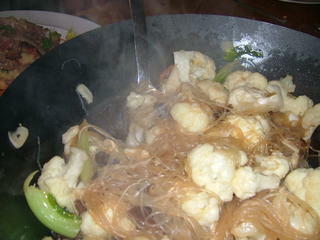 This dish needs pea thread noodles – a very thin noodle made from mung beans. These noodles are one of my favourite kinds; they’re thread-thing, transluscent and glassy, and they don’t go slimy in sauces. I broke off half a packet and made them soft in boiling water, then drained them and rinsed them under the tap in a sieve. At the same time, I took eight dried shitake mushrooms and put them in boiling water to rehydrate. When they were soft I sliced them thinly. I thought my Chinese food craving had been squashed for the week. Unfortunately, writing this meal up has made it come back again. Time for a pork floss sandwich. Emails and comments have been arriving asking what the hell pork floss is. It’s not something I shall be cooking for you, since I don’t want another bout of RSI (this is a dish which needs several hours’ constant stirring); besides, it’s one of those things I always fill suitcases with when returning from Malaysia. 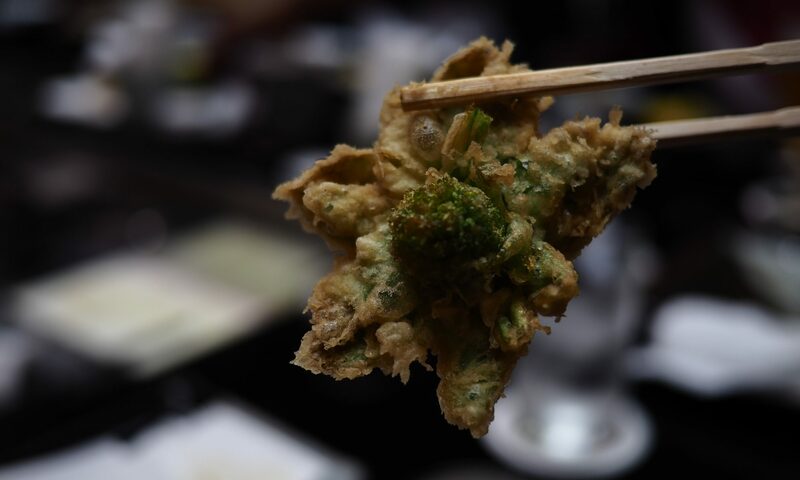 There’s an excellent post at Umami on pork floss, which I commend to you. Pork floss is, simply, lean, lean pork cooked with spices, sugar and sauces until the muscle fibres come apart in a dry, flossy mass; it melts in the mouth and tastes beautiful. It’s a gorgeous garnish, a delicious snack and one of my favourite things.